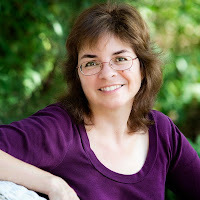 LESLIE: One pleasure in writing the Spice Shop Mysteries is discovering new-to-me spices and blends. Harissa is a North African blend that Amanda Bevill, owner of World Spice Merchants in Seattle and co-author of World Spice at Home, compares to American chili powder, but with more complexity and depth of flavor. Her blend combines caraway, coriander, and cumin seeds, which are toasted and mixed with guajillo chile flakes, garlic, smoked paprika, Hungarian (or sweet) paprika, pequin chiles, and ground cinnamon. Much easier to buy a small jar! We find harissa to brim with flavor, not heat. The smoky touch from the paprika gives it a dark, earthy flavor, accented by the chiles and cinnamon. To my mouth, it’s more reminiscent of mole than of chili powder, with an almost chocolate-y depth. In this recipe, the honey adds a lovely sweetness that complements the other flavors without overwhelming them. Harissa is also available as a paste; if you use a paste in this recipe, substitute it for the powder but start with a smaller amount of olive oil and thin to a workable texture. This is also not your usual mint and tomato accented tabbouleh. 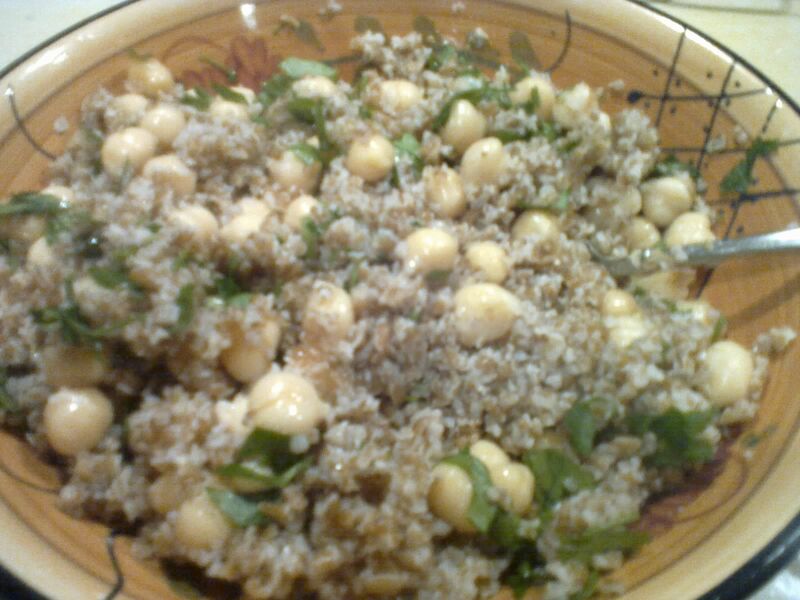 The bulgur and garbanzo beans or chickpeas are a great combination. 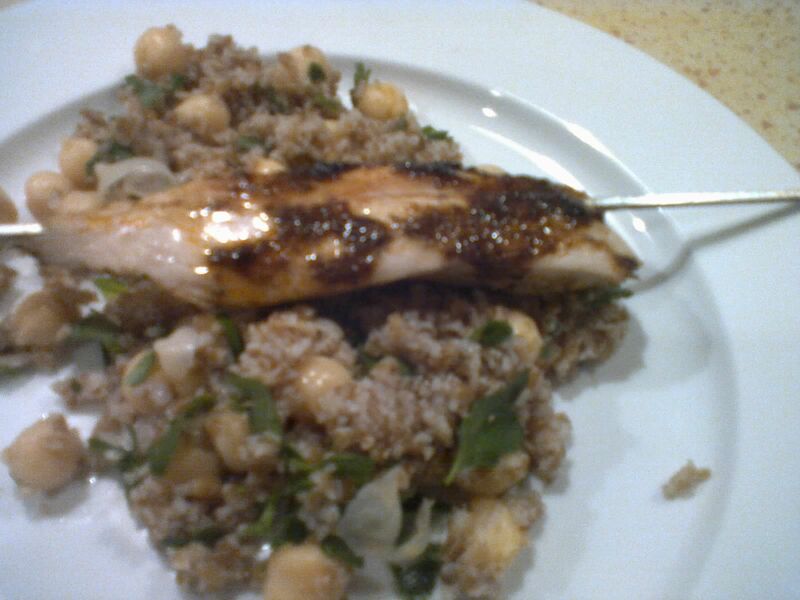 We used red bulgur because we had it, but any variety will do. It takes about twenty minutes to cook, so start it and let it cook while you make the sauce and grill the chicken. Harissa is also great to spice up nuts. Combine 2 tablespoons of harissa powder and a tablespoon of kosher salt. Stir into a pound of raw almonds and cashews. Spread on a baking sheet and roast at 375 degrees for 8-10 minutes, stirring once to cook the nuts evenly. Place the baking sheet on a rack; the nuts will continue to brown slightly as they cool. 1-15 ounce can garbanzo beans or chickpeas, drained and rinsed. Cook the bulgur wheat following package directions. While the bulgur is cooking, mix the harissa powder with the olive oil and honey in a small bowl to make a paste. Cut the chicken into long strips and thread on skewers. Brush with half the harissa paste. Grill 6-10 minutes, turning once, until cooked through. Mix the bulgur with the garbanzo beans. Stir in the parsley, lemon juice, and salt. 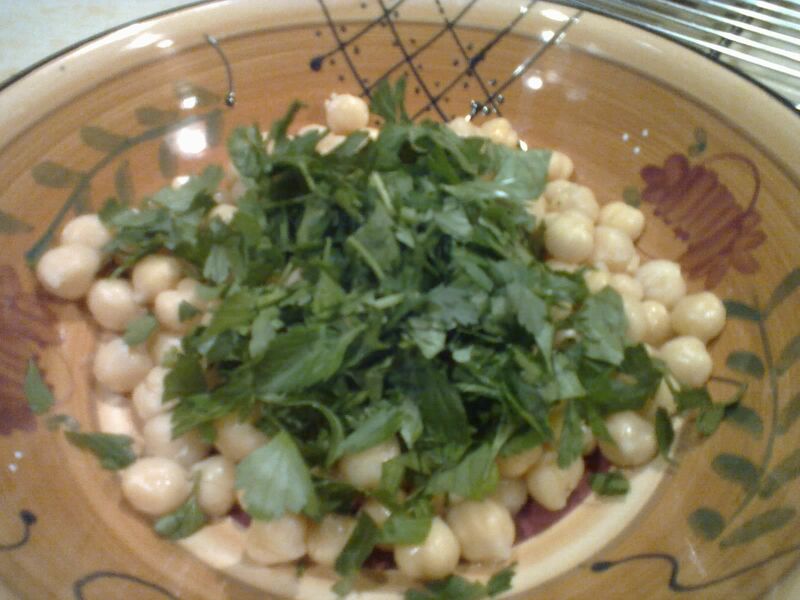 Place the tabbouleh in a shallow serving bowl. 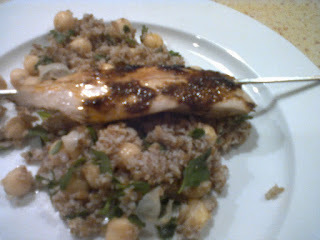 Remove the chicken from the skewers and place the strips on the tabbouleh. Drizzle with reserved harissa. Thank you for clarifying so nicely what harissa is. I've been seeing it mentioned a lot recently and wondered where is fit in the taste spectrum. You're welcome, Libby. Amanda's book includes recipes for many of her shop's favorite blends, including harissa, although as with all blends, variations abound. Love the recipes and the series! Thanks for sharing. The harissa powder sounds like an amazing spice mix -- love World Spice Merchants! Thank you, but I beg to disagree -- READERS are the best!